Adds craftable potions that give you a perk point. Not getting perks fast enough? Have tons of gold and void salts? Then this mod is for you! Use your materials to craft Potions of Knowledge and gain perk points from beyond the realm of man! Created the mod. Planning to add more flavor text and optional versions that add both a higher gold requirement and alternate (elemental) recipes. 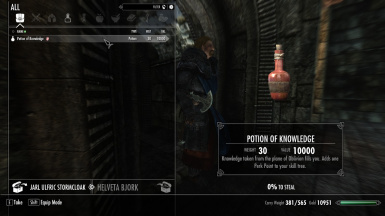 Adds the Potion of Knowledge, a craftable item that, upon drinking, will bless you with knowledge from Oblivion and give you a Perk Point. - Go to any smelter with 10,000 gold and make a bar of "Re-Forged Gold." This strange metal is highly malleable with an extremely low melting point. Alchemists believe that it may be due to the oxygen and iron left over from previous activities in the smelter. - Acquire 3 "Void Salts" and one "Ale." - Bring these three ingredients to any cooking pot in all of Tamriel and mix the three together. The "Re-Forged Gold" will simmer in the "Ale" as the "Void Salts" dissolve into the strange drink. The glass bottle that formerly contained the ale should be left over to contain the elixir you have just made. - Drink the potion and catch a glimpse into Oblivion itself, gaining knowledge and true insight.